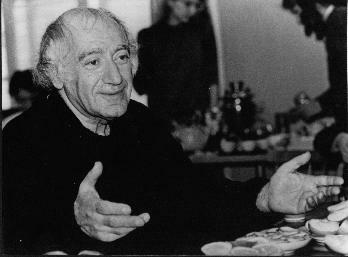 The by far most popular Armenian Composer is, without any doubt, Aram Khachaturian. Together with Sergej Prokofiev, and, of course, Dmitri Shostakovich, he was the most prolific composer of his time. I heard about him the first time, when my piano teacher pulled out some sheet music with a sonata by him, which I loved, despite or because his strange musical language. By this time I didn't know his fellow composer Awet Terterian (1929-1994). The publicity of the man is inversely proportional to the genius of the music, which does not lead to an increased number of performances. Terterian wrote for almost every genre, including soundtracks for movies. Not everything convinces me, but not everything by Mozart convinces me as well, so that is not a surprise. More surprising is the distance between his short works, for example the song "The Nightingale and the Rose" after a poem by Pushkin, which exists in a piano transcription by Hayk Melykan on Youtube. His most interesting works are his large-scale compositions, that is to say, his symphonies and stage works. He wrote to operas, "Der Feuerring" and "Das Beben" ("The Earthquake") and eight symphonie. I will focus here on "Das Beben" and his third and sixth symphony, since I know this works best. "Das Beben" was premiered in 2003 in Munich, at the Theater am Gärtnerplatz by conductor and Terterian-scholar Ekkehard Klemm. It was, originally, commissioned by Edition Peters, in 1984, for a performance in Halle, by that time part of the GDR. The opera calls for a very large orchestra, which wasn't placed on the stage, where the audience was sitting, but in the pit. The narration, based on the story "Das Erdbeben in Chili" by Heinrich von Kleist. Although the story remains almost incomprehensible, the music is all the more intriguing. Terterian loves to work with repetition, which is a characteristic trait of his music. Dorothea Redepenning, author of the brilliant multi-volume work "History of the Russian and Sowjet Music", assumes vague reminiscences of Armenian folk music, which may or may not be true. In any case, the use of traditional musical elements was encouraged by cultural politics of the communists, but certainly not in the way Terterian employed it. His music is too loud, too long, but on the other hand too reclusive to work as a device for propaganda. For example, a choir is shouting the same words for minutes, while on the stage isn't happening much. There is an uneasy force in this music, not to be compared to minimal music, which I will discuss later. Unfortunately there is no video footage available of the performance in Munich, but some lucky guys managed to upload some snippets from a perfomance of the Armenian Nation Opera, probably in Erewan. A more extreme example are the symphonies, especially the Third. It is marked by the extensive use of percussion instruments and timpani, sometimes beyond the physical capability of the ear. Here, too, Terterian alludes to traditional Armenian music by employing the Zurna and the Duduk, two reed instruments. But again, he is as far away as it gets from using it to allude to Armenian (folk) music. The music is extreme loud, shrill, and acidly, that a willing connection to folk music is suffocated in an instant. Even when it is not loud and difficult to hear just because of its physical intensity, as in the second of the three movement, the music does not become simply "convinient." In the second movement, a single tone - though not loud - is hold throughout. Nobody has breath enough to hold the tone for almost ten minutes, so the player has to employ special breathing techniques, but it causes the listener physical pain to experience a tone played way beyond the capabilities of human lungs. Melody-wise, there is not much happening in the first and third movement. Terterian does not seems interested in melody but rather in building up kind of monumental soundscape (likewise in his Sixth Symphony). His device is repetition, and this puts him in the vicinity of the American minimalist composer. Nevertheless, I will argue that his music is as far away from minimal music as the music of Morton Feldman is. The aesthetic of minimal music as displayed by Philip Glass or Steve Reich features a dense field of sound in which small changes achieve a strong effect (e. g. "Piano Phase"). It also generates an atmosphere a trance by fast moving patterns and a very characteristic sound color (e. g. "Einstein on the Beach"). In contrary to that, Terterian is not interested in small changes, his music rather accumulates power, but without necessarily discharging it. From the first note, his music is present (as is minimal music, too), but there is still an increasing intensity. His music is not without development, though not in the classical sense. Terterians music should be played more often in the concert hall, as well as his opera. I guess, it is still looking for the right audience, although there are some performances. The Website http://terterian.org collects performance dates and other interesting information. Thank you for introducing Avet Terterian and by that, our website as well! I am very impressed with the 5th symphony. This builds in force rather like the development of a cyclone, and the massive central section is sustained in a similar way to the passage of a cyclone centre. The third contains some extraordinary PRIMAL "blocks" of sound. I seem at times to be hearing the drums of a primitive tribal ritual combined with the "chaos" of a classical orchestra going equally hysterical. It's a fascinating experience.